Captain Tony's Pizza franchise business opportunity. Free Captain Tony's Pizza business franchise information. Capture your own Piece of the Pie! Captain Tony's Pizza and Pasta Emporium is leading the way in pizza franchises. Our restaurant specializes in dine-in, take-out, and delivery of mouth-watering gourmet pizzas, operating from a minimum amount of space. 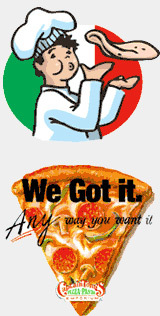 Captain Tony's Pizza has been ranked over the years as the very best in the entire <?xml:namespace prefix = st1 ns = "urn:schemas-microsoft-com:office:smarttags" />Rochester, New York area. Our pizza is offered to our customers in the "Anyway you want it" system, allowing them to eat a pizza the way they want it, choosing from a variety of pizza toppings and combinations. Service and quality are consistent at any of our locations which include dine-in or take-out formats. Royalties are 4.5% for 0-20yrs. Maximum royalty is limited to $500.00 per week Equipment costs are low and leasehold improvements will vary depending on whether you have a full service, dine-in restaurant or a take-out and delivery unit. To learn more about the Captain Tony's Pizza franchise opportunity, simply complete the form below.